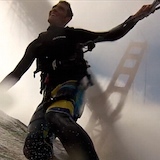 Bay Area Kiteboarding • View topic - BAK 2018 Order: Custom Hydrofoils! Re: BAK 2018 Order: Custom Hydrofoils! Out of carbon fiber ? And you have different stiffnesses for different water conditions? Very cool I'm intrigued ! Can I bolt my stringy wings onto your mast and fuselage ? As I love my stringy but the Weight of the mast and fuselage. Thanks CdoG, my fuselage will share the Liquid Force bolt pattern (at wings. I don't know what version of stringy wings you have... if they are the 6-bolt they will not compatible. My fuselage allows for longer grip length fasteners hence the reduced number. The first batch of masts will all have the same stiffness, a nice blend of weight and performance. Perhaps in the future, like way way in the future, I could have custom layups. But for now I need to minimize the complexity and load on my shop. Project Cedrus Mast+Fuse is 1.7kg and the LF Happy Mast + Carbon fuse is 2.9kg. So huge weight savings from your current setup. I'm happy to report that yesterday I secured enough deposits to cover my tooling and fabrication down payments. We'll be going into production shortly! A few spots left in the Launch Customer batch, get in today! The production mast will be lighter, stiffer, stronger, and maintain laminar flow throughout a wider angle of attack regime than the prototypes! If you look at under Sports and leisure you'll find Kyle's project. Wanted to thank my launch customers for their patience and support as we enter the final week of serial production for Project Cedrus. Very exciting to see all the detailed design work pay off with a smooth manufacturing process. Initial feedback from the first rides have been extremely positive. Hope to open up another batch of orders sometime, but now focused on shipping and taking a little break from the craziness! It's finally time for my review of Kyle's Project Cedrus setup. Background: I have been non-race foiling for 3 years and I consider myself reasonably accomplished at gybes, toe & heal, and I'm maybe %90 at air-foot-switches. I ride a Kanaha Shapes 37" pocket board and I recently had a few hours at Nitinat Lake BC riding the Cedrus Foil. My impressions. Very smooth ride, without any of the erratic "cavitations" or "sonic booms" that can occur on masts & fuselages with poorer shapes. Looking at the span of the CP Kyle mast I had initial concerns that it would have some of the issues I experienced riding the 1st Gen LF narrower mast.... but Kyle must have found the perfect sweet-spot for mast design, span & length. I pushed a ton of torque through the setup on many reaches and I never once brokeout with a blowout. Regarding the super lightweight on the water... It's nothing short of a pure delight. In waterstarts you really notice the neutral floatation as you can lay everything on its side and it will wait just so forever for you. My other setup is a Ghost Whisperer/Moses and Kyle's is similar, and possibly noticeably lighter. In addition, this lightweight makes for plenty of nimble snappy fun when you drive a tiny board like the KS 37 through sharp turns with Kyle's creation. The only "negative" (which for myself is a non-issue) is that I've heard from at least one purchaser whos motivation was some concept of a "soft" LE and trailing edge on the mast for avoiding cuts and injuries. The composition of these surfaces is still pretty hard stuff so I don't know if it would still cut through a wetsuit or bare skin. Needs some TOW testing. It's softer than carbon or aluminum, but still fairly robust. Imagine a plastic milk crate material. The LE is blunt enough to not cut, some potential on the trailing edge.